Beautifully situated on a hill in exclusive Sandy Lane Estate, this exceptional home enjoys gentle breezes and stunning views of Caribbean Sea from every room. Nestled among the Mahogany trees on three acres of lovely gardens, Solandra features distinctive architecture and a spacious living/dining room opening out onto a large covered terrace with a panoramic view of the sea. The Master bedroom, features a king sized bed and a unique garden bathroom complete with circular tub and a large shower. The other two bedrooms also have private bathrooms. 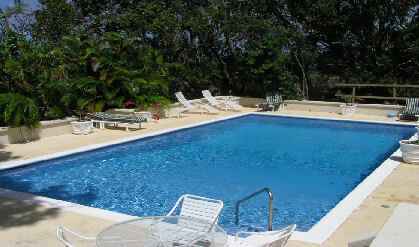 All bedrooms are air-conditioned, and open out onto the patio of Solandras 40 foot swimming pool. Rental includes the use of a private cabana at the Sandy Lane Property Owners Beach. LOCATION: About 1 1/4 miles to Sandy Lane Property Owners Beach Facility, Tennis Courts, just under 2 miles to Holetown, 7 miles to Bridgetown and 16 miles to Airport.